On Sept.8, Disney Jr. Home Entertainment released the new DVD, “Mickey Mouse Clubhouse: Mickey’s Monster Musical,” which finds Mickey and all his friends in their favorite fun and spooky adventure. With nearly two hours of song-filled fun, including five additional episodes and a trick or treat mini tote, Mickey’s Monster Musical is here just in time for Halloween! Packed with singing, dancing, laughter and surprises, Mickey’s Monster Musical is a high-spirited treat that can’t be beat. 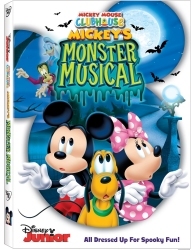 The DVD contains the following episodes: ‘Mickey’s Monster Musical’ (Part 1 & 2), ‘Mickey’s Pirate Adventure’ (Part 1 & 2) and ‘Mickey’s Farm Fun Fair.’ ‘Mickey Mouse Clubhouse’ also features the voice talents of: Bret Iwan as Mickey; Russi Taylor as Minnie Mouse; Bill Farmer as Goofy and Pluto; Tony Anselmo as Donald Duck; and Tress MacNeille as Daisy Duck. Please be advised that this movie may not be suitable for all children under the age of 5.